When Naked Drinks contacted me to review their new Coconut Water I couldn't say no; I've become a little obsessed with coconut products recently since trying to reduce my sugar intake (see my glowing review of Tiana's Raw Organic Coconut Goodness). New at Asda! Dessert Hybrids, Cheesecakes, Gateaus, Pies, Ice Creams etc. Some new stuff I've seen in Asda recently...I wouldn't usually feature supermarket own brands but they've done so many interesting dessert variations I just had to! Seems like chocolate orange and toffee flavours are very popular this year! Chosen By You Chocolate Orange Gateau: this looks delicious! Free From Mincemeat Crumble Squares: These Christmas squares sound very unique; they're gluten-free and contain crunchy shortcake biscuit with a sweet mincemeat topping. Well done Asda for doing something seasonal that's also gluten-free! Lovely Bubbly Chocolate Frozen Mousse: I imagine this is like Aero in ice cream form. Asda Chocolate Orange Ice Cream! 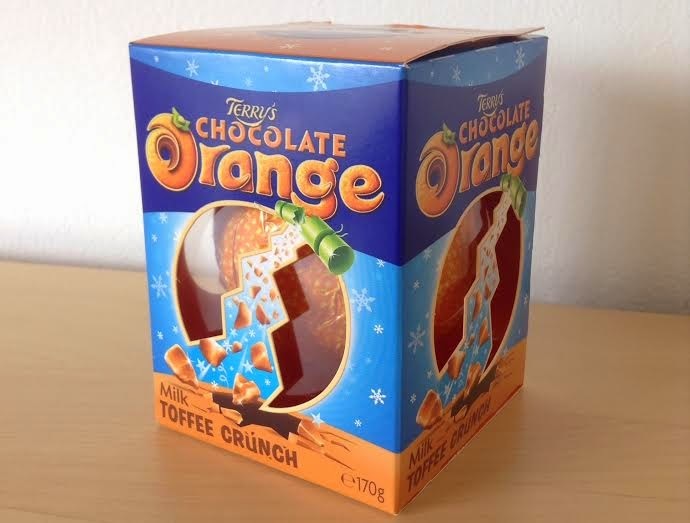 : fans of chocolate orange will love this no doubt! Shloer Berry Punch: Not exclusive to Asda, but I noticed this Limited Edition Berry Punch Schloer there which I presume is for Christmas. Plus these new Chocolate Flavour Oreo Ice Cream Cones. Tesco Halloween Slime Cookies: These look so cool and unique - green cookies filled with a gooey raspberry filling! Krispy Kreme Fizzy Lime Trick & Chocolate Truffle Treat: I don't know if these are new but the lime one sounds interesting! Spotted at Tesco. Krispy Kreme Chocolate Fudge Cake: Not Halloween-themed but apparently this is new...Spotted at Tesco. Lindt Halloween Ghost Sticks: These look suspiciously similar to the chocolate carrots Lindt did at Easter..."Milk chocolate ghost sticks filled with hazelnut nougat". Spotted at Tesco. Haribo Fangtastics: Haribo have changed the name of Tangfastics to Fangtastics...get it? Spotted at Tesco. Chewits Vampire Fangs: More fang shaped jelly sweets. Spotted at Tesco. Rowntree's Fruit Pastilles Halloween Edition: These appear to contain just purple and orange colours from regular fruit pastilles. Spotted at Tesco.